Spend your holidays in the countryside and discover a different Spain. You will find our houses at only 45 minutes from the coast, surrounded by nature- an island of peace and vegetation.We are located at 10 km from Olot, the main town of the shire, famous for its natural park of volcanoes and walking paths. "El Molí de la Plana" is a neighbourhood of three houses near the village Riudaura, away from roads and traffic noise. 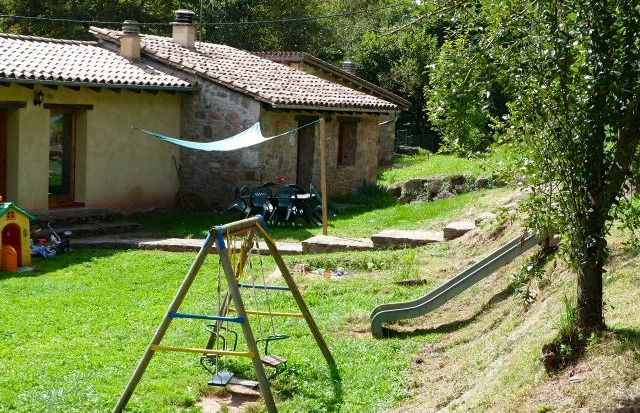 La Rovirota offers a cosy and friendly atmosphere with the corresponding confort of rural houses with 2 ears. La Rovirota with its heated swimming pool, its playing grounds and gardens, is the perfect place for peaceful holidays with your partner or family. Great for children! Consult availabiblity for the heated swimming pool. Airport in Girona ( Barcelona Costa Brava)- 1 hour drive. Airport in Barcelona ( El Prat)- 2 hour drive. If you want to enjoy a nice and quiet stay in Catalunya, then we advise you La Rovirota-El Moli de la Plana in Riudaura. We stayed 2 weeks in La Cabanya: a top-rural gite for 2 persons, well restaured and with good comfort, a swimming pool (in a veranda) in a quiet valley with 5 authentic guesthouses, surrounded by woods. We enjoyed our walking trops in the vulcanic La Garrotxa and the Alta Garroxta with peaks up to +/- 1300 m. Also the visits of mediavel villages (Santa Pau, Bésalu) and the historical centers of Olot an Girone were very intresting. We were very well received by the sympatic guestwife Sira, who gave us also usefull tips. We spent 2 beautiful weeks in the very charming and comfortable Cabanya at La Rovirota. The Cabanya is compact - with bedroom (queen size bed) and bathroom downstairs and a live-in kitchen overlooking the mountains and woods upstairs. It has sun all day round, a remarkable variety of birds and is the perfect place for quiet relaxation as well as adventures (there are very nice local hiking trails and a small stream nearby to cool down). It is well equipped and Sira, the owner, is the perfect host: warm, knowledgeable, and accommodating. This was our first trip to magnificent Catalunya and we will definitely return to the Cabanya. This was just what we were looking for- peace, tranquility, nature, a retreat. With tree covered hills and an abundance of wildlife, the setting is just sublime and the hosts are great- friendly, helpful and couldn't have made us feel more welcome. We stayed in the old mill which is full of rustic charm and I slept like a log most nights. The wifi could be better, but as we were wanting to have a proper break I saw this as being not such a bad thing! I would love to come back and would have no hesitation in recommending La Rovirota. I arrived in early October for a full two weeks stay (to work on some project on the computer) - and I enjoyed my stay very much: The place is quiet, very well maintained and you can ask the owner for any help and will for sure get it (like additional kitchen equipment). Bed was very good (not old, not too soft), there is highspeed wireless at least in the hut and outside (! ), and looking at the donkey + baby donkey is just enjoyable, also. The pool is just an extra add-on, I wouldn't want to miss. The only thing is to go hiking directly from the farm there are only few paths, but plenty of them in the villages around (you'd need a car thou, obviously). We stayed at El Vell Moli de Baix for a week in September and were extremely impressed. This small complex is beautifully converted and can accommodate couples and families alike. My husband and I needed to relax and get away from it all and this was perfect. Our accommodation was basic but extremely comfortable and the setting is stunningly beautiful with mountains all around. You are 1.5 km from the village which has very little, so driving is a must. The nearest town Olot is fascinating and has good bars/restaurants and an excellent market. The nearest restaurant. La Canal, on the outskirts of Olot offers very good food and excellent entertainment in the form of the staff - tolerating our bad attempts at Catalan! Sira, the owner of the property, is lovely - excellent English, very helpful and charming. We will definitely be going back and taking friends with us. One tiny criticism is that we like to cook with good local ingredients (in abundance) and there was nothing in the kitchen in terms of basic cooking ingredients such as oil, salt and pepper. Thank you Sira, look forward to seeing you again. La Rovirota is great for family holidays - but will be nice for couples as well. The cottages have been restored in a simple but tasteful way, which gives you a warm homely feeling, and although basic, they have everything you need, we got a cot for our 2 yr old, and there's a lot of space where children can play and run around. There were other families there but it never felt crowded, on the contrary, La Rovirota has a very friendly atmosphere, and if my Catalan had been any good it would have been nice to make more friends. My 2 yr old loved the toys that were available for children outside in the play area and in the play room, and my 8 yr old had a lot of fun going down to explore the stream and in the swimming pool, in the greenhouse. We were there for a week and spent a couple of days at the cottage, or walking to the nearby waterfalls, where you can also swim (but it's v cold water! ), and the rest of the time going around other villages by car. In Olot we hired bicycles and rode to Les Presses, a short ride of about 5Km, which was ok for the children. There are a number of beautiful waterfall around there and lots of walks. The nearest village where you can buy food is Riudaura, pretty little village, about 10 mins by car from La Rovirota, but bear in mind they have no fresh milk and a limited selection. But we spent a morning at the fruit and veg market in Olot, which was great. There is a really good restaurant between Olot and Riudaura, Bar Brasa La Corda, which merits a visit, especially if you're not vegetarian. Sira, the owner of La Rovirota, is very friendly and always ready to help, plus her English is excellent. We'd like to go back again!